Welcome to Black Bear Den, you will love this spacious cabin that sleeps 18. There are two master bedroom suites and two additional spacious bedrooms. The master suite on the main floor opens up to the balcony that has incredible views, offers a Jacuzzi jet tub, fireplace and 55" flat screen TV. The master suite downstairs offers a Jacuzzi jet tub, 55" flat screen TV. 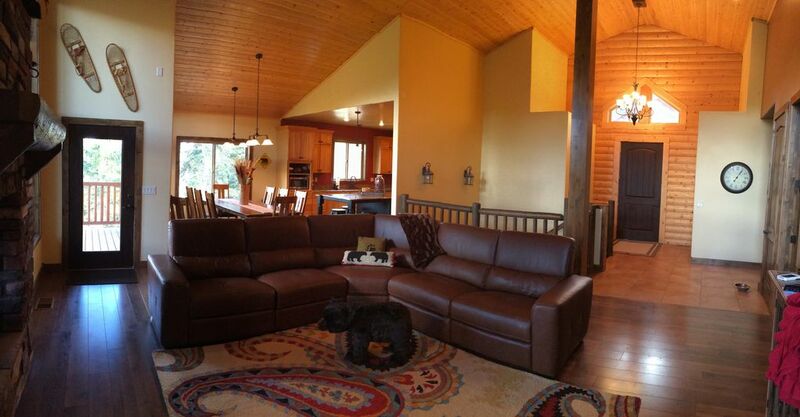 The main floor living area is a delightful open area with fireplace, 70" flat screen TV and beautiful wood floors. The kitchen is an absolute dream with a large island great for preparing meals for a large gathering. Large eating area off the kitchen that seats 10 and 3 at the island bar area. The furniture is of the highest quality and professionally decorated. We love Brian Head and have owned here since 1987. In 2015 we found our dream cabin nestled in the woods. It is not unusual to have deer cross through our yard and see a variety of other wildlife in the area. It is a secluded cabin in the trees built in 2006 and was built as a custom cabin. In other words it has all the custom qualities of a wonderful home and cabin. We want to share it with you and we hope you have a wonderful time visiting Brian Head, Utah. If you are looking for a spacious, clean, updated with all new furnishings, beautiful views, close to the slopes, walking distance to Apple Annie's, in the trees and a relaxing atmosphere then you have found paradise at the Black Bear Den. With chairs during non-winter months. This was my second time staying on this cabin. The place was well-kept, and returning to this place made an instant comfort for all my family and my friends. It felt like visiting my aunt's home for the Christmas. The location was convenient for skiing and snowboarding. It was about 2 minutes to Navajo Lodge and about 3 minutes to Giant Steps. We had multiple pick-ups for the kids since they all ended their skiing session at different times, but they were super-easy. All the items were fully stocked, such as paper towels and toiletries. We went with 7 kids, and they loved the two bedrooms with bunkbeds (two in each room, where you can comfortably sleep 6 per room). Leisa has been always communicative. She informed me on the night before my arrival about the planned power outage. I had to call her for an emergency at 12:15 am, and she answered and provided instructions! Since the house is two-level, it made the staying much easier on everyone. We had some trouble going up-and-down the stairs when we stayed on a cabin that was tri-level. It was little warmer when we stayed this time. There were 7 space heaters that were in the laundry room, so we placed three of them to the rooms downstairs since we knew that the temperature and comfort level were different from people to people. One caveat: the road from the cabin to the main street, although it is 20 yards or so, it is little steep. Should there be any snow or ice, two-wheelers had trouble going up that part of the road. (Last time, it was Hyundai Santa Fe, and previously Honda Odyssey and Toyota Sienna). I would recommend snowchain. This was our second time staying here and the house is gorgeous and very spacious. We were hitting the slopes within minutes of pulling out of the driveway. We will be staying here again in the future. We had a great time staying with one other family for 3 days during ski week. Plenty of room and well equipped. Would recommend staying again! This was our second time to rent this "luxury cabin in the trees" and our sixth winter trip to Brian Head. This is by far the best rental that we have utilized. Great house, great layout and a FULLY stocked kitchen. Within about a half mile of the ski resort, Navajo side, and the local store is just up the road. Can't think of a better or more comfortable place to stay while at Brian Head! If you are within three weeks of your desired rental date and the cabin is not booked on the calendar, please contact owners for special pricing.